Have we got a gorgeous project for you! This is Joann's first post on our team, and we are seriously super impressed by her skills! 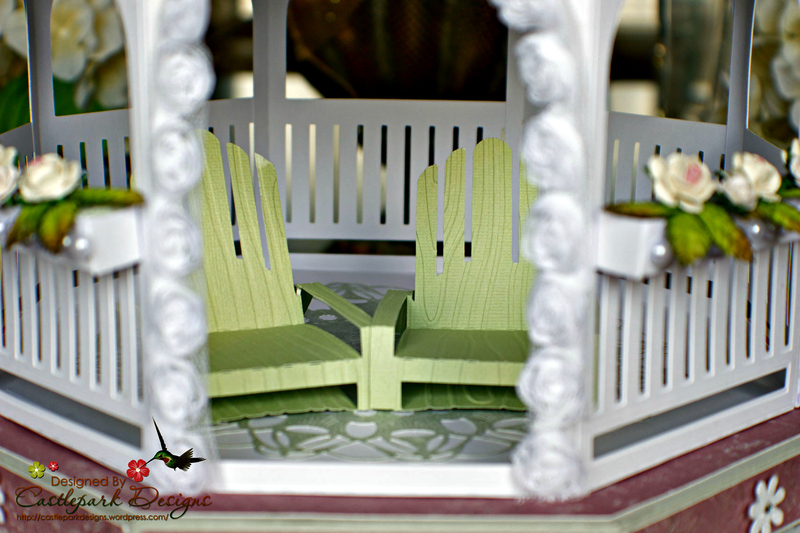 See all the details on this beautiful 3D Gazebo! Today I am really excited to share with you my first project for the Craftwell Design Team featuring the new Teresa Collins ‘Beautiful Words’ embossing folder & ‘Woodgrain’ embossing folder. One of the big things we love to do in the Summer is spend time at our cottage but we rarely take the time to enjoy it. We always have too many projects and not enough time. So this year I want to spend more time sitting in my Gazebo. With that in mind I decided to create my Dream Gazebo! 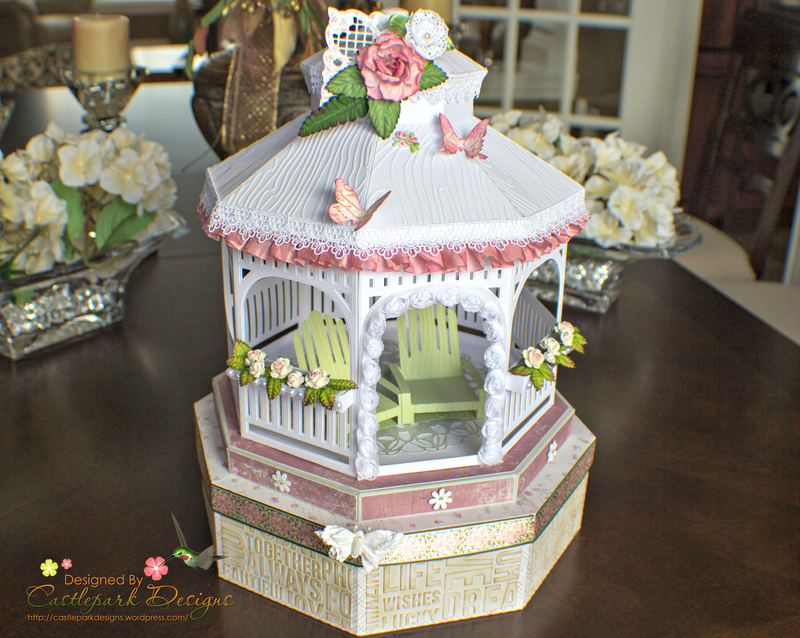 I used the Winter Gazebo SVG Kit from SVGCuts.com and papers by Maja Design and Pion Design. There is a detailed video on how to assemble this kit on the SVGCuts.com website. For the roof panels and the panels on the box base I passed them through my eBosser using the Teresa Collins embossing folders before I attached them to the project. Another trick I like to do with the ‘Beautiful Words’ embossing folder is to ink one side of the folder before you emboss the card stock. By doing this, you get the appearance of raised letters in the card stock. Here is a closer look at the top showcasing the gorgeous Teresa Collins Woodgrain embossing folder. and finally I added a few chairs inside which were also embossed with the Teresa Collins Woodgrain embossing folder. In addition to using the amazing Craftwell eBosser, I used the Teresa Collins ‘Beautiful Words’ embossing folder & ‘Woodgrain’ embossing folders. If you have not used these embossing folders, I strongly suggest that you give them a try. Since they are 8.5" x 11" in size you have the capability to emboss many things in 1 single pass which makes creating just that much easier. Be sure to follow Joann on her personal blog for more project inspiration! Are you impressed with Joann's project? If so, be sure to leave her a comment! We couldn't agree more Mary!